The faces of the women depicted by Suzuki Harunobu (鈴木春信) are often of an inexpressive sublimity: whether they are courtesans, city women or commoners, their features are full of charm that needs a frame that helps us to contextualize their role and to configure for them a personality that takes them away from the pure beauty of form and gives them back a part in the theater of human affairs. 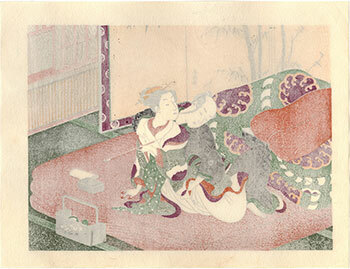 The woman depicted in this woodblock print is a prostitute yujo (遊女) lying on a soft pile of three futon (蒲団). She holds a kiseru (煙管) pipe in her hand and is smoking, mischievously, on the face of her guest for the night. His right hand is already in her private parts, thus loading the elegant scene of an irresistible and impatient desire. The work, originally published around 1769, is presented here in an edition made in the '70s by the engraver Denkichi Kuga (久我伝吉) and by the printer Keichi Noguchi (野口慶一).